Nebraska has more irrigated acres of cropland than any state in the United States; even more than most other countries. As a result, Nebraska has a long history of water use and of designing systems to manage agricultural and other water uses for current and future generations. People from around the world come to Nebraska to learn about its Natural Resources Districts (NRDs), water research at the University of Nebraska and the agriculture – and irrigation – that are the strengths of the state’s economy. Nicholas Brozović is director of policy at the Robert B. Daugherty Water for Food Global Institute (DWFI) at the University of Nebraska and a professor of agricultural economics at the University of Nebraska–Lincoln. Brozović studies water use in agriculture, including the economics of water use, how agricultural producers make decisions and the design and impact of water policies. He works with decision-makers at local, state and national levels, but also meets one-on-one with producers around the world to learn how policies affect their operations. “We focus on agricultural water management and how we can use water efficiently and profitably while maintaining environmental and public health,” he explained. DWFI faculty, such as Brozović, work with local, national and international partners that bring a spectrum of perspectives to each project. The University of Nebraska founded DWFI in 2010 with a gift from the Robert B. Daugherty Foundation. Bob Daugherty started Valley Manufacturing in Valley, Nebraska, in the 1950s and made and distributed the center pivot, which was a revolutionary system for agricultural irrigation. The company later changed its name to Valmont Industries, and today is one the largest irrigation companies in the world. DWFI’s mission is to increase food security with less pressure on scarce water resources by improving the use of water in agricultural and food systems. “We work with many different types of people, from smallholder producers in places like India and sub-Saharan Africa, to large producers in places like western Nebraska, trying to learn something from everyone,” Brozović said. And in turn, people come to Nebraska, from everywhere, to learn. Nebraska’s NRD system was established in 1972 and is unique in the United States, Brozović said. District boundaries are based on river basins and the NRDs are tasked with managing a range of natural resources. Each of Nebraska’s 23 NRDs has different issues related to climate, land and resources, so every district has developed its own programs and priorities. NRDs attract visitors from around the world who are interested in learning to manage groundwater in agricultural settings, Brozović said. For example, a group from the World Bank visited Nebraska in 2017 and included 11 senior managers from Africa, the Middle East, South Asia and East Asia. During their weeklong tour, the group visited NRDs, equipment manufacturers and dealers, farmers and agronomists, with the goal of sharing knowledge and creating systems in their own countries that improve groundwater governance. Brozović said the World Bank managers were interested in how the districts were structured, with technical staff and locally elected boards of directors. “They were interested in how the districts interact, how they deal with compliance issues, how they are funded and how decision-making works,” he added. “The World Bank tour group heard again and again that it takes time; it takes decades. You have to build trust very carefully to have a functional system,” Brozović said. One important way to build trust in a management system is through the careful use of technology. 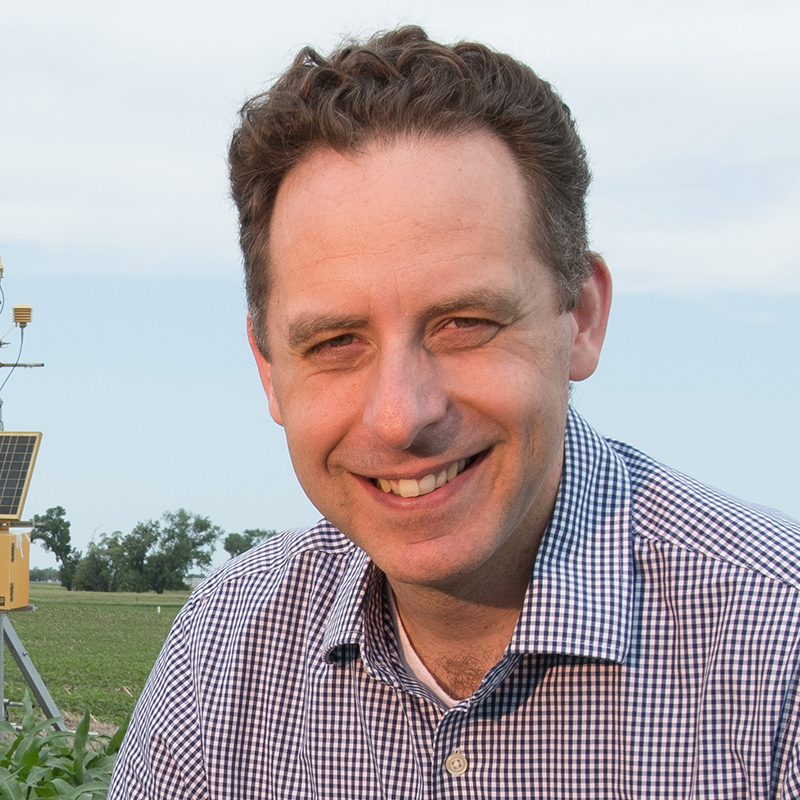 Agricultural water users in Nebraska use a wide range of technology to determine and meet a crop’s water needs, from satellites and drones to soil moisture probes and variable-rate irrigation systems. Many of the NRDs have programs to help their producers try new technologies and practices that can conserve resources and increase profits. Importantly, according to Brozović, the usefulness of technology often is not about providing enormous amounts of data. Its real value is to help provide information that can be used not just for day-to-day operations, but also to build longer-term understanding about what decisions might mean over years or decades. When used well, technology can lead to insightful conversations between farmers, and between farmers and others. The importance of those one-on-one conversations sometimes is a surprise to international visitors, Brozović said. “Often, the reason systems work is due to the human aspect and not the technology on the ground,” he said. Brozović hopes that managers who visit Nebraska will return home and implement lessons they learned to improve groundwater governance in their countries. “I think we’ve helped to really put Nebraska firmly on the international water map and now, people regularly talk about what is happening here as a place to look toward for lessons for how you manage water use in agriculture,” he said. Brozović said visitors often ask questions about the Ogallala Aquifer, which is part of the High Plains Aquifer. The deepest and widest part of the aquifer is under Nebraska. “It is a common misconception that the High Plains Aquifer is rapidly depleting everywhere, but in Nebraska, that is just not true,” he said. “For the most part, it is very stable.” In Nebraska, a significant part of that stability is due to the NRD system and its long-term vision for water use, he explained, along with the favorable geography of the Sandhills, which supports refilling of the aquifer. DWFI has Faculty Fellows across all four campuses of the University of Nebraska system, including all colleges and disciplines. As an agricultural economist, Brozović works with environmental engineers, biological systems engineers, law professors, journalists and faculty in the university’s School of Natural Resources, among others – and he shares interdisciplinary resources with students in the courses he teaches. “The course covers all things water and how it has affected people throughout human history,” he said. Brozović and the other course instructors – Cory Forbes, associate professor of science education and Trenton Franz, associate professor in the School of Natural Resources and a hydrogeophysicist – take students through hydrology, water law and policy, stormwater management … even the Nile river irrigation civilization.